When you are in a relationship, it is not just your mind and soul that is into it, your body is too. 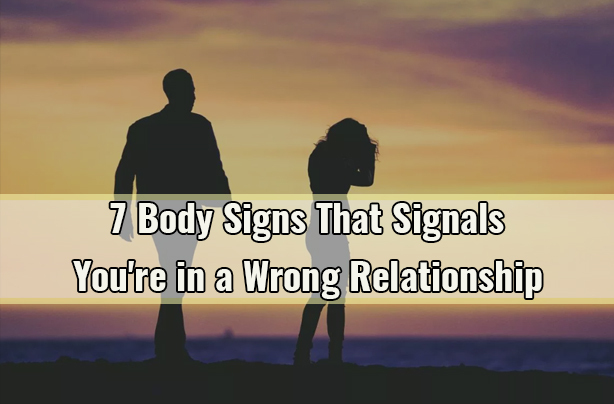 And, if the relationship is bad or toxic, then your body screams at you to get over it, for you are harming it. Now, whether you listen to your body or get on with your sado-masochism, is up to you. But your body will continuously send you signals and it ought to be for your own benefit, if you listened to it. A glorious, full-mouthed smile is a signal of a happy and content relationship. But if your relationship is not as good as you want it to be, there wouldn’t be any reason for you to smile. Hence, you appear morose, forlorn and sad to everyone around you. And smiling is a chain reaction. You would smile only when you feel happy inside, and that will happen when you know everything is going in the right direction for you. A bad relationship can lead to low self-esteem. For, when a relationship becomes toxic, it is pretty ordinary for your partner to hurl abuses at you and tell you things that would be increasingly harmful and hurtful for you to hear. And, add that to the fact that it comes from someone who once meant the world to you and claimed that you were the best for them. Your self-esteem is definitely going to take a hit. You feel tired all the time. Nothing gives you happiness anymore. Every single day, you wake up to have a fight with your partner. Every night, you go to sleep fighting. This relationship takes a toll on you physically and mentally and you are unable to handle the toll it takes on you. Even your spirit is dampened and you radiate a tiresome vibe. You are always at their beck and call, all the time. They might need you at 11 pm at night and you might be tired throughout the entire day, but you would have to meet them, no matter what. They don’t really care how much it affects you, but your body does. So, its time you actually start prioritizing your body, because that would pay dividends, nothing else. When you are stuck onto something that you don’t really want to let go, you try to believe that everything is fine. But, it isn’t, and you believing that it is, will crush your body. Your over-indulgence in this nonsense would spell doom on your body- something you have vowed to take care of. This is the most common feeling in a relationship that has turned toxic. You force your body to go through the same thing again and again, without actually hoping that things will get better. You don’t even try anymore, but you are also annoyed about it. You don’t like the situation you are putting yourself in and your body is constantly rebelling against it. You are annoyed by what your partner has put you through and what they put you through every single day. Your body screams at you to stop it, otherwise, you end up being frustrated and angry with others. So, are you aware now?